Given the current level of violence and the fear of it becoming more widespread over time, there has been some interest in bulletproof backpacks. Some parents have considered this something that they can do to give their child some security and protection when they are not there. A bulletproof backpack or insert also has the potential for a bug out or get home back. Some armor is better than nothing when you are in any position that may put you in the line of fire. Those that work in public areas may also want to consider a bulletproof bag to keep in their office or cubicle. Government agency workers that may be targeted during political or economic strife should consider some protection that is easy and legal for them to have on hand. The cost of a bulletproof backpack is under $200 in most cases. While that is not nothing, it is a price that can be absorbed into a lot of budgets. Keep in mind that the packs that come with an insert are also made to be very high-quality bags that will give you many years of reliable everyday use with little maintenance or care involved. Some of the bags have removable inserts so that if you ever wear out the exterior backpack you can just pull out the insert and put it in another pack so you keep being protected. The insert will stay for a long time if you don’t crack it or use it to take a bullet. Check the life expectancy of your armor before purchase so you know when it is getting old and in need of replacement to ensure maximum protection at all times. 4 What level of protection is right for me? 10 Insert Or Pack with Included Insert? Any body armor is rated to let you know how large a caliber or how fast a velocity of bullet it has been designed to stop when it is fired directly at the armor or panel. The higher the level of protection, the more you are going to pay. With some calibers being more common than others, plenty of people get a lower level. Remember that if you can get behind something else, your armor/panel will not have to take the same velocity or impact that it would otherwise. A lower level panel could still help you stop a bullet that normally would only be stopped by a panel that was rated at a higher level. Level 1 – You don’t really see anything with a Level 1 rating unless you are buying a used product. This level was around when bulletproof technology was still being developed and honed to the exceptional level we have today. Level III-A – This is a high level of body armor and tested against .357 SIG and .44 Magnum bullets. If you have ever shot a .44 Magnum you know what I am talking about when I say that it is an extremely powerful bullet that can take down a Grizzly bear. I don’t practice with a .44 because it is too big for most circumstances. Having body armor or a pack that can stop something like that is pretty amazing to me. This is typically the level of armor used in packs and mid-priced inserts. This level will not stop an AR-15 or AK-47 round. For those that don’t remember, the AR-15 is what was used at the Parkland, Florida school shooting. Level IV – This will stop armor piercing rounds and is the highest level of protection you can currently buy. Typically this is used by SWAT teams and those that are at risk for being under heavy fire from large high-velocity rounds made to penetrate as deeply as possible. The higher rated plates are made of hard materials and weight more than the Level IIIA and below plates. You cannot reliably stop a larger or high-velocity rifle bullet with the Kevlar-based soft plates found in most of the premade packs and clothing available for purchase. If you are buying an insert or pack for a younger child, this is something to keep in mind. Double check the weight of any bag or insert to make sure it is an ok weight for the age and size of the child you are buying it for. What level of protection is right for me? Most actual shootings occur via a handgun not a rifle like the AR-15. 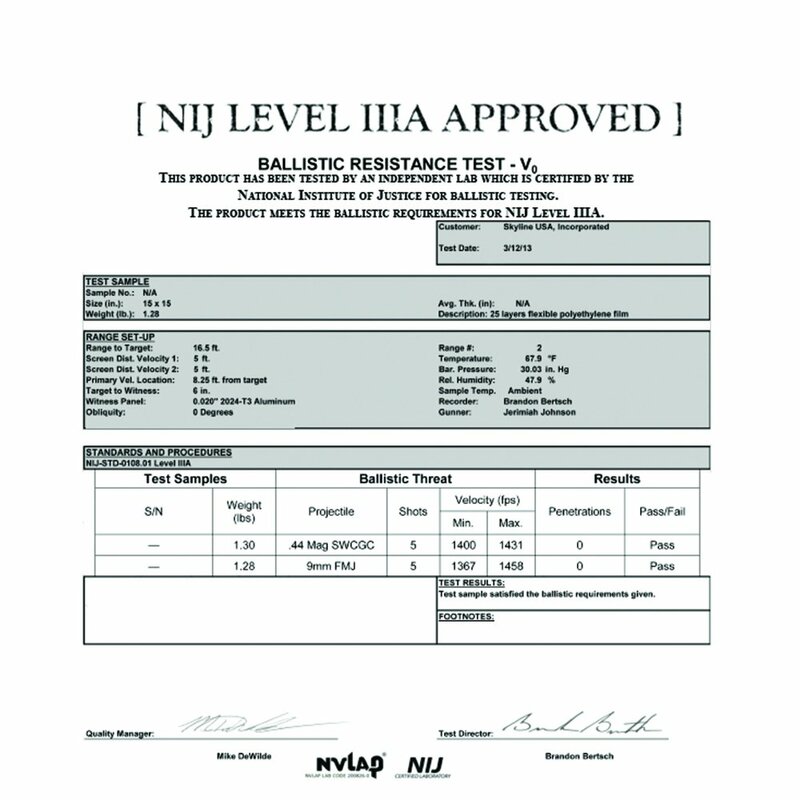 This means that Level IIIA is all that would be needed for protection in almost all incidents. I know that the major incidents you hear about involve rifles, but that is just because the average shooting is not going to get the big news play. Level IIIA is just fine for folks that are concerned about walking home from work or school or getting caught up in any urban incidents. Daisy Luther at The Organic Prepper did a post on the most violent cities in the world and 5 of them are in America. Level IV is enough to protect you from armor piercing rounds, AR-15s, AK-47 rounds and more. It is a lot heavier than Level IIIA because it is made of ceramic and hard materials rather than the softer IIIA panels made to offer protection but be lightweight. Many inserts and bags are tested to stop 5-6 bullets. This means that if you take a lot of fire some bullets may penetrate at least partially. Gunshots can be fatal without actually penetrating the armor. If you have certain health conditions such as heart arrhythmia or just get hit hard the impact can cause a fatal cardiac event no matter what age you are. Lower level plates are made of softer materials and that means while the bullet may not penetrate you, you are still dealing with the armor pushing in on you on impact. The contents of your pack can help add extra stopping power. Laptops, heavy books, extra padding from coats, and more can all help prevent injuries or decrease any potential penetration. The packs I have found below all offer Level IIIA protection. For Level III and IV protection, you are best off getting an insert due to availability. Major manufacturers of these premade packs seem to favor the IIIA rating for their standard packs. This pack offers a lot of comfort. The gel padded straps make this a pack suited to those that are traveling a lot or just walking around with what they need to get through the work or school day. Basic styling with all the modern features makes this a pack that you can blend in with. You get a nice padded sleeve that fits a laptop up to 15 inches and 20 pockets to keep things organized. According to the ballistics tests done on this pack, it was shot 5 times each with .44 Magnum and .308 and there were zero penetrations. I like how Guard Dog includes a copy of certified test results in the pics they post on the Amazon description. It is always good when a company is upfront about the real quality of what they are selling you. I could see this bag being useful for creating a bulletproof 72-hour kit or a get home/EDC bag in case of civil unrest or a natural disaster. For a long term bug out bag, it is a bit on the small side for an adult but could make a decent child-sized bag. This is a classy looking business and professional looking backpack. The smooth leather style and TSA approved opening with RFID blocker pouch makes it a good choice for those that have to travel for work or that need something that looks good enough to replace a briefcase. Let’s face it, a good backpack is far more useful and practical than a briefcase for travel. This pack is definitely designed with the size of kids in mind. The panel and pack is lightweight enough for grade schoolers and it is made to keep them organized. The insert can be removed if desired and easily placed back in. This is a very tough school bag but if you do happen to wear out the outer bag, keep in mind that the bulletproof insert has a 5-year warranty and can be put in other bags if desired. This is the most expensive pack on our list. Some of the features that make it stand out are that it has a zipper that allows you to take it apart and make it into a body armor vest in no time at all. The straps and webbing are designed to be removable so they can be utilized as tourniquets, drag straps, or even for adding security to a door. There are a lot of different compartments in this bag including some hidden in the shoulder straps. An RFID blocker pouch allows secure carry and storage of chip cards. Molle rigging makes the pack compatible with a lot of accessories. At just over 6 lbs this pack is not light but given how big it is as and the amenities it offers that is to be expected. This bag could be used as a bug out bag with some planning and additions made of course. Any bag that has armor in it is going to weigh a few pounds more so the weight is just something you have to deal with if you want bulletproof protection. You can make up the weight in other areas such as using freeze-dried rations and clothing that is lighter weight yet keeps you warm and dry. Sure, all that can make a bug out bag cost more to put together but being able to carry more and keep weight down can be well worth the investment in a SHTF scenario. This is a smaller Guard Dog pack but it boasts a lot of storage compartments and is made to unzip all the way making it great for travel or those that work at facilities where bags need to be easily searchable. I think it is kind of neat that they included a battery bank in this bag. Who doesn’t have a cell phone or some other small device that it would be useful to be able to keep charged? For those concerned about the theft of personal information, there is an RFID blocker pouch to keep cards in for work, travel, or play. AR500 makes affordable Level III & IV plates that can be inserted into backpacks easily. There are different sizes for different applications. They are a popular brand so be prepared to wait up to a week for your order to ship out when demand is high. If you are concerned about being in a major event then this is the level of insert you want. Here are a few options for plates that offer a higher level of protection. This plate is made of monolithic ceramic & polyethylene with comes with a 600 Denier water-resistant cover. It weighs 8.3 lbs and is a solid inch thick. This weight and bulk make this too heavy for a younger child to have in their pack along with their other school supplies. I was pleased to see that it has been tested against multiple hits. Lead time to get this plate is 3 weeks at the time of writing. This insert is made to fit a lot of different packs and it offers protection against rifles. The price tag is hard to believe at $45 and is the rare exception to the rule I mentioned earlier about higher level plates costing more. The downside is that this plate weighs 10 lbs! That is a lot of extra weight to carry. This panel has been independently tested and rated to NIJ 0101.06 standards to defeat six (6) rounds of 7.62×51 M80 NATO Ball from 51’ at 2,780 feet per second. AR500 has a wide selection that I encourage you to explore before making your purchase decision. Insert Or Pack with Included Insert? Go with a premade if you don’t need past Level IIIA protection. After looking at a lot of packs I have come to the conclusion that for most people buying a pack that already has an insert is a better option because it is more economical and you are guaranteed that the panel is the right size for the pack. Inserts are good if you have a pack already and just want to add protection. If you do choose to buy the insert because you already have a pack you like then make sure get the size that is best suited to your pack. Also, make sure to check the rating of what you are buying so you are clear on what level of protection you really have and what type of performance you are going to get over the years. If your child is attached to a certain pack, then adding an insert can be easier than making them wear a drab adult style pack rather than the playful designs the other kids have. School can be a rough place. I could see how being the kid with the parent that makes them go to school with a bulletproof pack could cause some negativity and even bullying. Allowing them to have a pack like everyone else but adding some protection could be a way to avoid them getting pinpointed as being different. Also, it decreases the chances that anyone notices the pack is bulletproof and steals it. Bulletproof bags and body armor being so common and desired is sad. Writing this made me think a lot about how disturbing it is that so many people feel that they need bulletproof armor to attend school or work. While many are calling for gun control as a solution to these problems, I think that a lot of the actual causes of the violence and lack of hope present today are being ignored. Banning guns will not stop acts of violence from happening on a large scale if someone or a group is determined to hurt others. I feel for the parents that have no choice but to send their kids to public schools that resemble prisons in many ways. Achievement is discouraged because if you stand out too much the bullying is relentless and since there is a no tolerance policy, kids have to be afraid of getting in trouble for defending themselves. When kids can’t sit still or are having emotional trouble, the doctors want to throw pills at it that have such side effects as increasing the risk of suicide and a slew of other effects that we are still figuring out. People want to talk about guns in the hands of young adults but it seems that the fact that all the major shootings in recent times were committed by men that were taking pharmaceuticals for emotional issues. I don’t want to scream for or against guns because that has been going on for far too long. What we need is people actually working together to combat the societal issues that have left the younger generations in tatters. People can say that it is lack of religion, lack of parental involvement, etc but it is far more complicated than all that. Giving kids productive and meaningful things to do instead of medicating them would be a good start. There is a difference between true chemical imbalances and disorders and boredom combined with an infectious lack of hope. It can be hard to try for better when you see people around you that are working full time or more and barely scraping by in the current economy. People are so busy meeting basic needs that any goals beyond that are out of their reach. I realize that there are some that are perfectly happy to just get by but if you are someone that wants more, it can be pretty hard to get there no matter how hard you work. There was a time in this country when a man out of high school could get a job at a grocery store, have a house, get married, have a few kids, get a new car every few years, etc and his wife didn’t have to work to make ends meet unless she wanted to. Now it takes two incomes to barely scrape by. It is a different world for the kids today. And they wonder why so many are pulling kids out of public school and homeschooling today. I am just one person and I don’t profess to know how to solve all these problems for they are so deep. I am hoping that we can all come together soon and stop the extremism and get things on a better path. Do you use body armor? Have you or are you considering making your child’s pack bulletproof? Have you ever been in a situation where you stopped a bullet with armor? What steps do you think are needed to fix some of the underlying problems causing these violent incidents? Please keep it civil and well thought out. Helping me prove that these things can be discussed in a civil manner.